What do you get when you mix a fine dining chef with a trendy location in the heart of Southern California? Your first guess probably wouldn’t be a home-style Southern fried chicken joint, would it? This Foodie Friday is dedicated to Buttermilk Fried Chicken in Old Towne Orange. BFC opened its doors in June 2018 by Chef Ryan Adams, who was previously at Laguna Beach’s Three Seventy Common Kitchen+Drink. The eatery provides Orange County residents with a third-generation family buttermilk chicken recipe that comes complete with all the fixings. Adams’ Sunday Supper at his previous establishment, featuring his grandmother’s chicken recipe, was such a hit that it inspired him to open a more casual counter-service restaurant entirely dedicated to the dish. Adams has emphasized the importance of local, farm-to-table cooking throughout his career, and this is reflected at Buttermilk not only through the restaurant’s modern farmhouse decor but also through their use of all-natural, free-range chicken and small batch family recipes. Adams has been open about his desire to go after KFC and elevate the fast-food fried chicken experience. Whether or not he’ll topple the Colonel’s kingdom is yet to be seen, but one thing we can say? Buttermilk is really cluckin’ delicious. Our IDG team loves this establishment, and it’s a go-to lunch run here at the office. 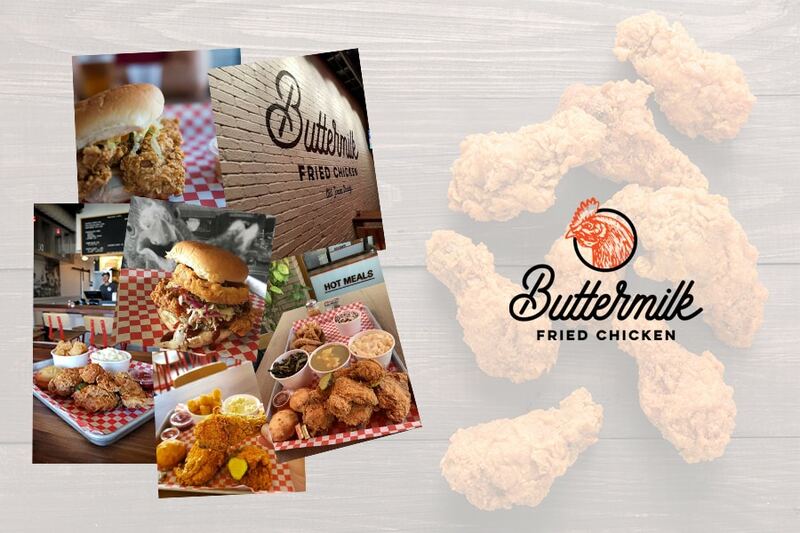 Don’t just take our word though, try it out for yourself and visit Buttermilk Fried Chicken in Old Towne Orange or visit http://buttermilkfc.com.